ONLINE BOOKING DISABLED - CALL FOR AVAIBILITY/RESERVATIONS AT OUR 6,000 Sq Ft FACILITY - 541-647-4433 - At 7' by 17' by 8" - this Stand-up Paddle Board has earned it's name as the most MEGA of all SUPs. It can easily handle 10-12 adults and children on the board with a 1,200 pound capacity, or 6 comfortably seated adults with the optional seating added at no charge. Pictured with only 4, it can handle much more. As you go down the river, you will be greeted with stares, waves and shouts as you pass by on this king sized paddle board. two people can easily carry it to the water and our specially designed trailer can transport it completely inflated. Comes with 2-4 SUP paddles, and life vests for all occupants. 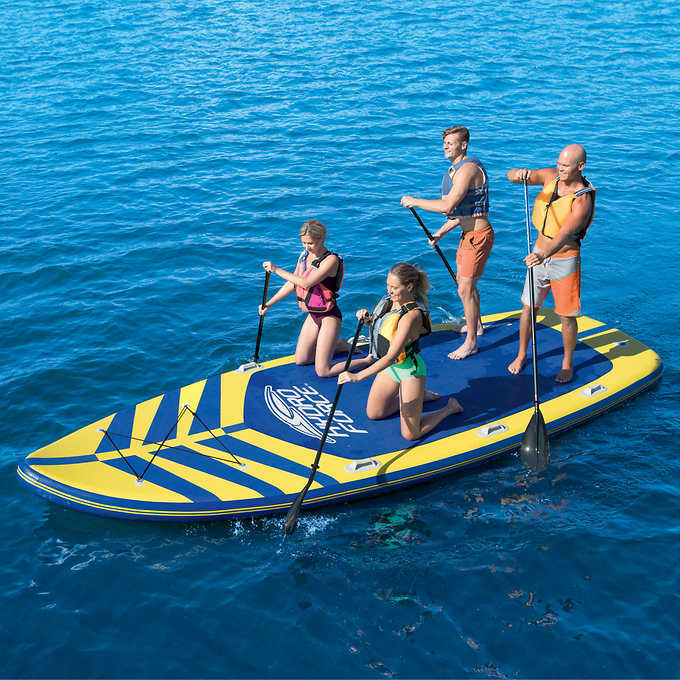 The MEGA SUP utilizes state-of-the-art drop-stitch construction and inflates to 12 pounds per square inch for an incredibly solid feel on the water. It is virtually un-tippable, easily maneuvered, has nearly zero wind resistance. Can be easily navigated down river with a single paddler at the bow or paddle upriver with 2 to 6 paddlers. Turns on a dime and with only a few inches of draft can be taken into very shallow water. In summary - It Rocks On The Deschutes!! !